In November 1968, the New York hip and trendy, always eager to check out the latest hot spot, found there was a new kid on the block. And not just any kid. Situated on First Avenue, it was called On 1st, and the name covered the entire facade. There was no shop window; whatever went on inside could only be seen on a number of television screens placed in the centre of the huge O. The entrance, a double-door tinted like sunglasses with black painted doors behind it, was formed by the letter N.
The genius, if that’s what it is, behind the project turned out to be as fashion photographer Bert Stern, who had conceived the idea of a shop with objects for the home designed by artists or fashion designers. Apart from promoting the Marilyn photographs that he had taken six years earlier ( the Last Sitting series) by having them transferred to anything from scarves to wallpaper, Stern invited a host of artists and designers, because On 1st was meant to be a shop of ideas. There was even an artist in residence, whose task was to produce them, whether they were usable or not. His name was James Lee Byars, a man who, in Sheppard’s words, ‘looked like a Mennonite father with shoulder-length hair, a wide-brimmed black hat and a frock coat’. She found him sitting in Stern’s office, the floor scattered with sketches on pink paper. On 1st was a thrilling, but short-lived adventure. The shop was closed in what must have been a matter of months , if not weeks. 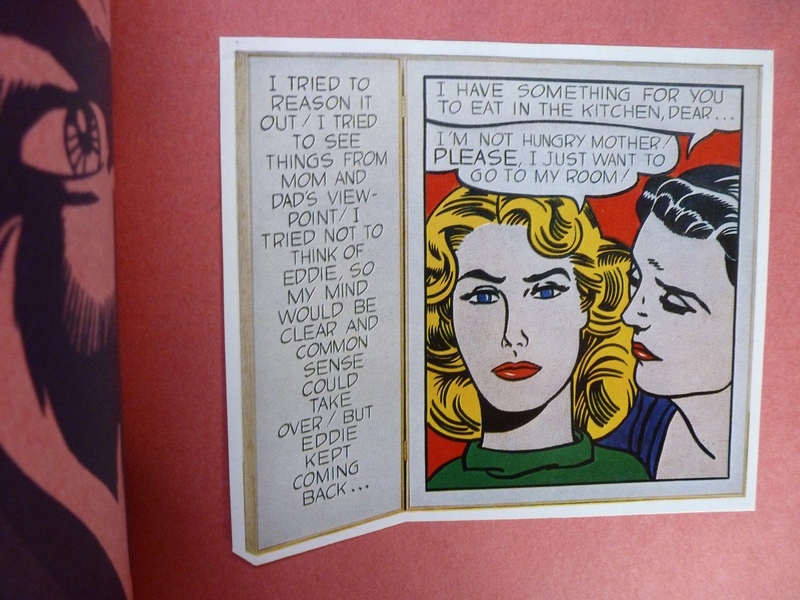 Curiously enough, the fact that it is remembered at all is largely due to Roy Lichtenstein. In any Google search his name is almost invariably coupled with that of the shop, perhaps even more often than that of Stern himself. 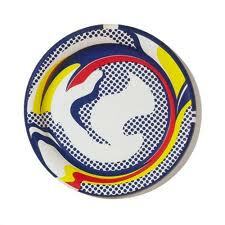 The reason is that Lichtenstein made some of the most important contributions to the project, and while the shop itself came and went, some of its products lived on and as Lichtenstein’s fame rose, the objects he designed for On 1st acquired legendary status. They include the wrapping paper, a high polish wallpaper that looked like stainless steel, and, most famous of all, the silkscreened paper plates. These were originally sold in shrink-wrapped sets of ten, a bargain at $3, and many of them must simply have been thrown away. What copies survived have since become rare and highly desirable. They now count as official Lichtenstein multiples and are listed in Mary Lee Corlett’s catalogue raisonné of Lichtenstein’s prints. 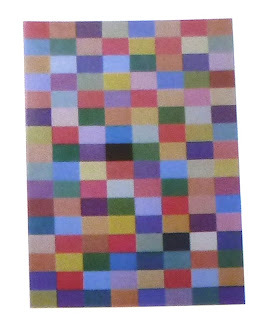 It is by no means uncommon to see them offered, neatly framed, in high-end art galleries, ‘price on request’. 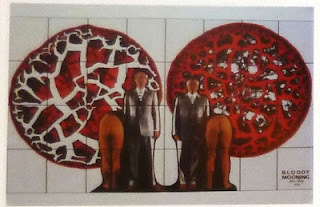 In other words, they have attained the status of Art. Some people might argue that in looking upon these and similar objects as objets d’art, we have come a long way from the artists’ original intentions, which were based on the idea of making original art available to a large public. And they do have a point there. On the other hand, with prices for Lichtenstein paintings soaring from one auction record to the next, the discrepancy between the original prices of multiples and ephemera and the prices you have to pay for them today is perhaps not, proportionally, so very different from those of his paintings. 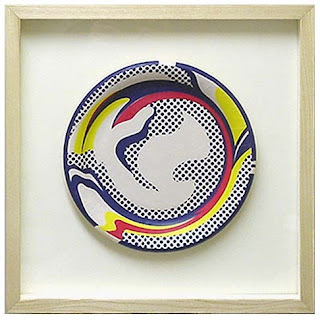 While Lichtenstein originals, and even prints, have risen far beyond the means of the vast majority of art lovers, the multiples , or artists’ ephemera, at least leave the not-so-well-to-do collector (the man or woman who genuinely interested in art for its own sake, as opposed to the professional art investor and the art speculator) an opportunity to obtain an original Lichtenstein design at a price he can afford. After all, collecting is, or ought to be, a matter of art, not merely a matter of money. Perhaps it is time to consider a re-definition of the ‘art collector’ and broaden it sufficiently to include the man who is happy to obtain an old issue of Time Magazine with Lichtenstein’s portrait of Bobby Kennedy on the cover, or a piece of wallpaper from Bert Stern’s shop, or an original poster for the Salzburger Festspiele. And yes, those, too, will originally have been sold at a fraction of the price you’ll have to pay for them now. But even so they can bring back some of the sheer joy of collecting that a hysterical art market has taken away from us. In 1990, Melvyn Bragg interviewed Lichtenstein for the BBC. In the first part (the other five can also be found on YouTube) he looks back on the rise of pop art in the early sixties. On July 3, 1982, the German television music program Bananas featured a very special guest. Not Fischer Z or Adam Ant, who were also in the studio, but artist Joseph Beuys who, accompanied by the group BAP, made his first and last appearance as a pop singer. His song Sonne statt Reagan (‘Sun instead of rain/Reagan’, with an untranslatable pun in German) formed part of a mass protest against the deployment of SS-20 and Pershing missiles in Europe and was recorded in support of the election campaign of die Grünen, the Green Party. It did not take the audience long to realize that Beuys’s talents unquestionably lay elsewhere, but it remains one of the most curious ‘art videos’ to date. 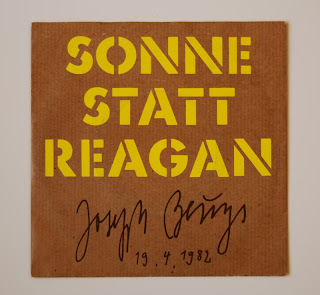 Beuys’s career as a rock star may have come to a premature end, the single Sonne statt Reagan is recorded by Schellmann as an official Beuys multiple (nr 447). The record came in a plain brown cover with yellow lettering, with the artist’s printed signature and the date 19.4.1982 just below it. Characteristically, he made also a special limited edition in an edition of 90, for which a reddish brown circle oil paint was hand printed over the ‘statt Reagan’ part and the record itself was signed on the label. The copy shown below comes from the regular edition. ‘Artists’ ephemera’. The term doesn’t exactly trip off the tongue. It’s one of those words, too, that may make you reach for the dictionary. Which is, in fact, is not a bad thing to do, because once you find out what it means and where it comes from, you realize it would be a pity to call the stuff by any other name. The word ‘ephemera’, from the Greek, literally means ‘things lasting no more than one day’, and could refer to anything from fame to insects. In modern use its meaning has been narrowed down considerably; the ever-present Wikipedia defines it as ‘any transitory written and printed matter not intended to be retained or preserved’. 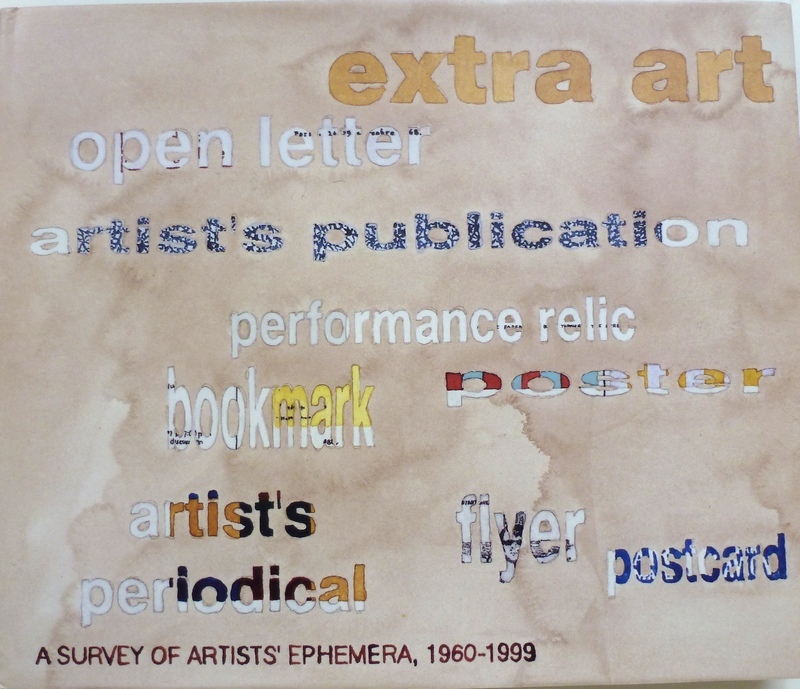 ‘Artists’ ephemera’, then, refers to anything created by artists for a particular occasion that, once it has served its purpose, may be discarded because it does not have any true value. In other words, things not worth collecting. Or are they? It is perhaps one of the cultural tragedies of our time that the phrase ‘art collector’ has come to be associated with people in auction rooms who calmly raise their hands just as the Warhol, or the Richter, or the Matisse, is about to reach the $100m mark. Or with classy art fairs where elderly overdressed couples are set upon by gallery owners trying to convince them that young so-and-so is the greatest emerging talent in recent years and will make a great investment. The world of art has become inextricably linked with the world of money and it has reduced most of us to the status of spectators, gaping bystanders, for the simple reason that taking part in it is well beyond our means. It comes as a relief, therefore, to discover that there still some corners of the art world left where art is not exclusively approached in terms of market value. In 2001, the California College of Arts and Crafts staged an exhibition entitled Extra Art: A Survey of Artists’ Ephemera , 1960-1999. It presented a very small part of the collection of Steven Leiber, a former gallery owner whose life took a different turn when , somewhere in the 80s, he bought ‘twenty-one boxes of crap’ from artist Jeff Berner. After sifting through it for more than a year, he concluded that what he found most exciting was not the most obvious material, but rather the things that lacked any intrinsic value: the flyers, the posters, the invitation cards, all the printed stuff that had, for some reason, escaped being thrown away. Up to his death early this year, he amassed what is probably the largest collection of artists’ ephemera in the world, published over forty sales catalogues (which have themselves become highly collectible) and became the acknowledged expert in the field. His single-handed efforts opened up a whole new field of collecting, for which multi-figure bank accounts are, thankfully, not a precondition. Leiber’s Californian exhibition was something of a landmark in the appreciation of art. Here, for the first time, was a museum presentation of stuff that had never been thought worth preserving. And it turned out to be great! The catalogue Extra Art became a classic overnight and remains the most important work on the subject to this day. 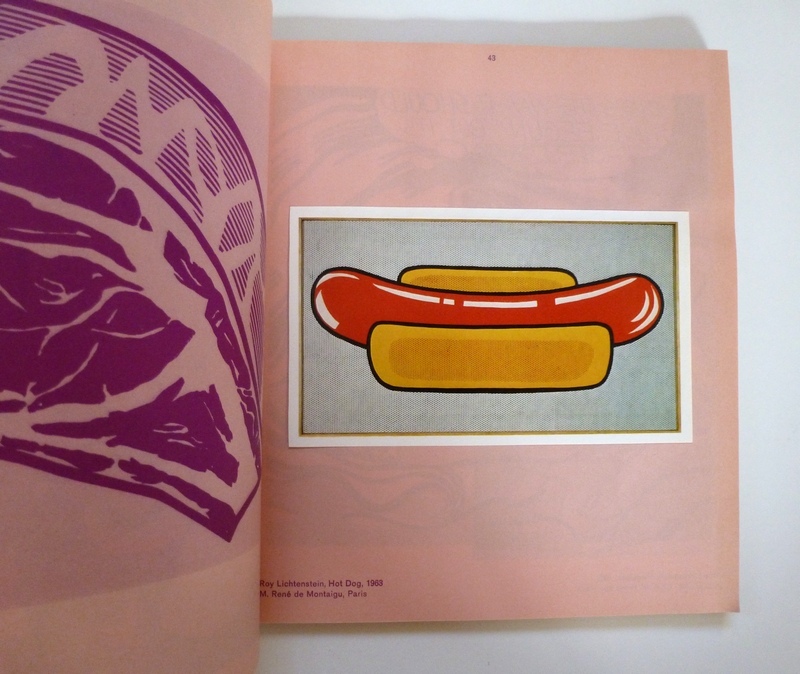 It is a book for the amateur, in the original and true sense of the word, featuring some 1500 items, all illustrated. Browsing through it for the for first time, as I did some months ago, is an extraordinary experience. Here are original works by all the great artists of our time, but as they were often produced in large editions, they are affordable. You realize with some surprise (at least I did) that it is possible to actually buy them yourself, often at less than the price of a dinner for two. Some of them, admittedly, are so rare that the chance of stumbling across them is practically nil, but there are others that, with any luck, may be found on Ebay or even at your local bookshop. All you need is an open eye and the realization that art is not created by rarity. Extra Art is more than just a feast for the eyes. It is a book that brings back the sheer joy of collecting: the thrill of discovering, and the satisfaction of acquiring something that, however small, enriches your life. And after all, that is what collecting is all about. Or should be. The relation between Lou Reed and Andy Warhol was always an ambiguous one. Although Warhol’s name is forever associated with the Velvet Underground (if only for the famous banana cover), on a personal level there were mutual resentments that precluded further co-operation. Even so, in 1990 Reed, together with John Cale, recorded the monumental concept album Songs for Drella (a pet name for Warhol). 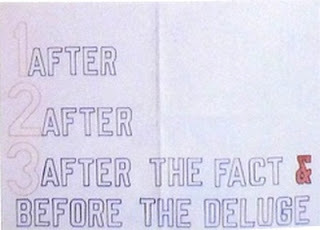 Using no more than Cale’s violin and Reed’s guitar they recorded fifteen songs, most of which reflected Warhol’s ideas. But in Hello It’s Me, the final track of the album, Reed, with an almost painful honesty, pays his tribute to Andy Warhol. Here in a rare live version, with French subtitles. ABC News, February 21, 1987: Andy Warhol dies in hospital. 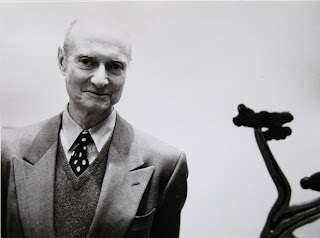 One of the world's most eminent art critics has died at the age of seventy-four after a prolonged illness. Channel Four was one of the many television stations who paid tribute to a remarkable man. For those who missed it, and who can spare the time (almost an hour's length), here is The New Shock of the New, a programme he made for the BBC in 2004. 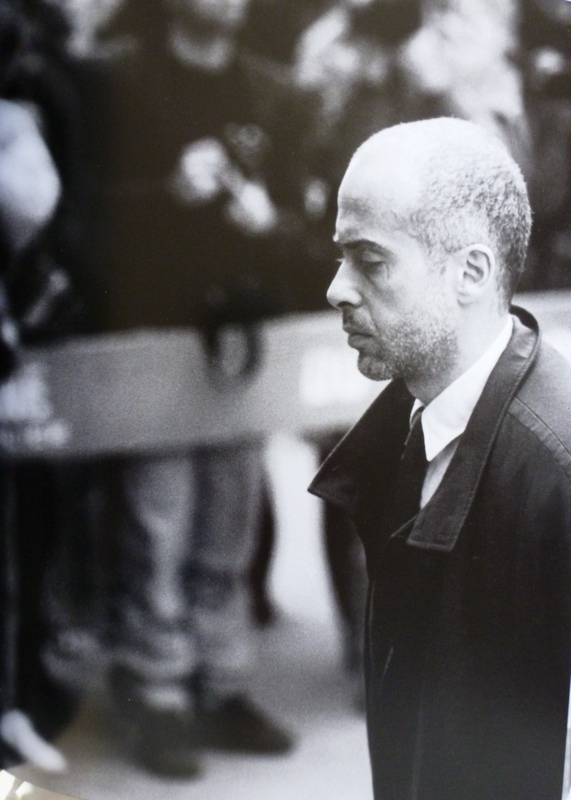 Andy Warhol’s funeral, inevitably and suitably, turned into a media event. On April 1, some 2,000 people assembled at St Patrick’s Cathedral, New York, to pay their respects. His friends were there, and those who claimed to have been his friends, or would have liked to be, and, of course, all those who were not but felt they could not afford to miss out on the occasion. Photographer Christophe von Hohenberg was in New York too, on a commission for Vanity Fair magazine. As the news reached him, he changed his plans and set out to photograph the seemingly endless flow of celebrities as they made their way into the church. For years the pictures were never shown, but in 2006 it was decided to use them for a special exhibition to commemorate the twentieth anniversary of Warhol’s death and to include a selection in a special book. 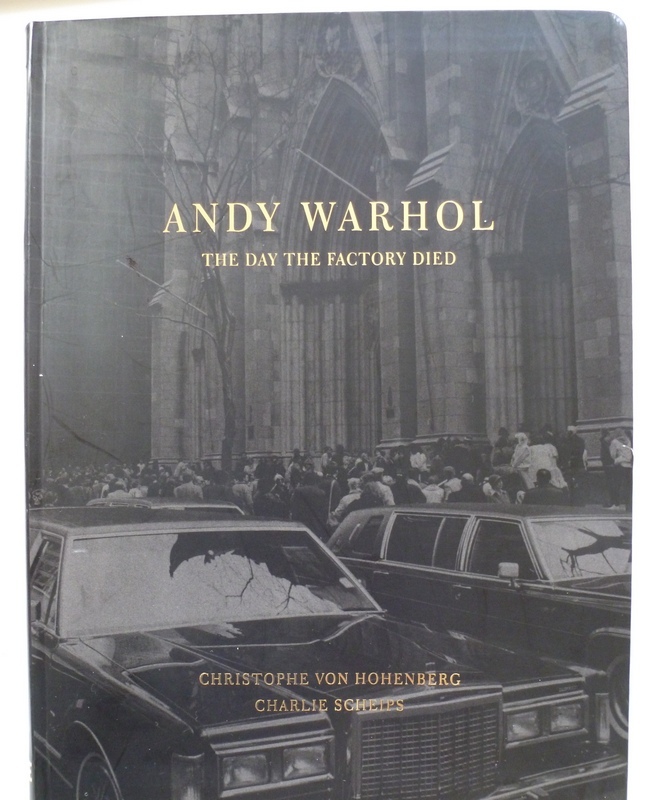 Andy Warhol: The Day the Factory Died is small art work in itself. Designed by Daniel Stark, it features a dark faux leather cover with gold imprint, rounded corners and a white ribbon, which gives it the resemblance of a prayer book. 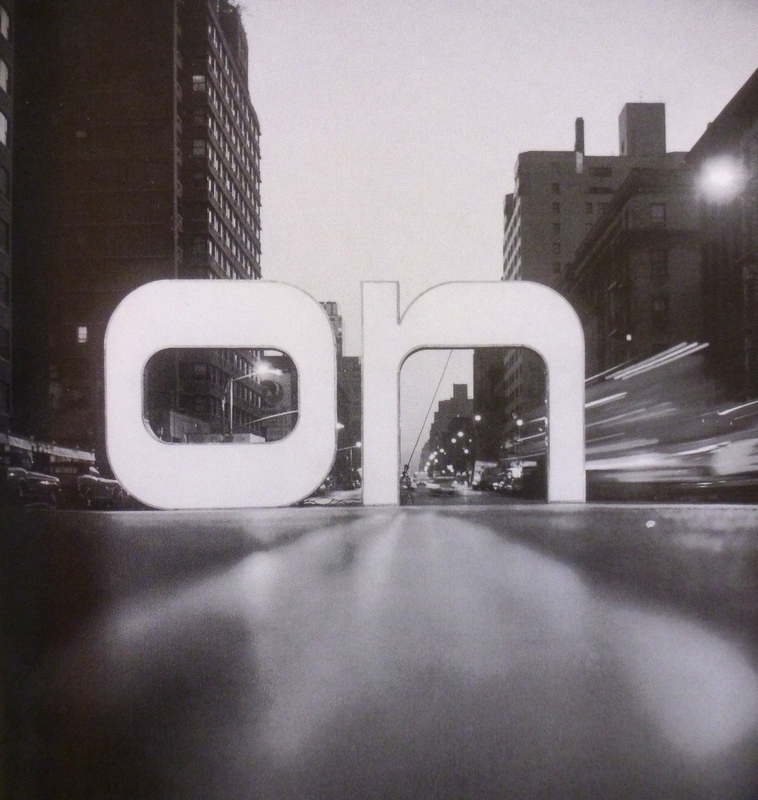 But for a short introduction and a text by Charlie Scheips (printed in two columns in an almost biblical font), the book consists of full-page black and white pictures of people crossing the short distance between the limos and the church door. Those not wearing sunglasses mostly look straight ahead, eyes cast down, but there is always the odd guest who cannot resist the temptation of half-posing for the photographer. Thus the book becomes a gallery not only of famous people, but also of looks and expressions. This is, I think, what accounts for the strange fascination about The day the factory died. With such a dazzling array of stars, it could easily slide into a game book of celebrity spotting (with answers being conveniently supplied at the end of the book). And Andy would have had no objection, to be sure. But at the same time there is something very solemn about these pictures, with all these people hurrying past, not looking into the camera and not flashing smiles on the photographer. They seem to radiate a general awareness that an era had come to a close. Ever since, Hohenberg's exhibition has travelled across the world. The interview below was recorded at the Amerikahaus in Munich, Germany.